Okay, Dennis Crowley. 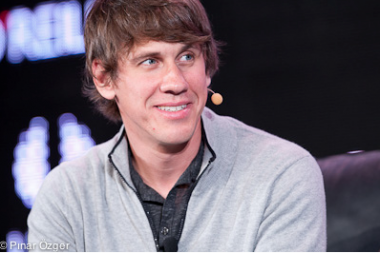 You’ve got $41 million in new funding to keep building Foursquare. What are you going to do with it? How are you going to grow the company? And how are you going to make money? Peter Kafka: It seemed like this funding round took a lot longer than you wanted. 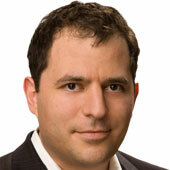 Do you think you could have done the deal quicker prior to the Facebook IPO? Dennis Crowley: I don’t know. There’s a lot variables at play here. I don’t want to point to any one particular factor. The thing that’s important is — hey, we just raised $41 million to do the things we want to do. That’s the thing that we’re psyched about. I just sent this email out to the team. It’s like “Hey, there’s not a lot of companies that get to play in this space. And guess what? We get to be one of those companies.” That’s a really big, motivating thing for myself, and I think for everyone else. Union Square’s Fred Wilson explained why a debt deal made sense for you guys. But you can also read between the lines and conclude that if you guys were able to get the valuation you wanted, you would have done a traditional equity deal. Is that a fair assessment? Some of the things we were hearing from people was that we’re a difficult company to value. Because, you know, we’re rolling out new stuff every single month. And it’s not like we’re just putting a new coat of paint on the app. We’re rolling out new merchant tools, we roll out credit card specials. We’re in this space where we’re reinventing mobile, local, deals with merchants; we’re doing it very quickly. You look at what we’re doing, and you can see that this is going to be incredibly transformative. And we have some people who say, “you guys are still small, but we can see how you’re going to do it.” And given those circumstances, the way we structured the deal was the best way to do it for a company of our stage and our size. I understand your messaging about transforming from a check-in tool to a search app. But why are you always talking about becoming a location layer for the Internet? What does that actually mean, and who’s supposed to care about that? Should users care? One check-in on its own isn’t interesting, and maybe 10 isn’t interesting. But you put millions of these things together every day, and you suddenly have this heat map of where people are. You can start to predict where people are going to be, and what was popular two weeks ago, and what might be popular in the future. So we can do that, and start sharing that, not just with our users, but developers, too. So we’ve got this point-of-interest database, and we’re sharing that with developers like Path, Vine, Flickr. The stuff that we’ve built is powering the location features for the whole next generation of consumer Internet services. But just to be clear. If you’re a user, you shouldn’t know or care about that data, right? Well, a lot of consumers don’t know that Foursquare data is powering this stuff. But there’s also an opportunity there, for every time a Vine is tagged with something, every time a photo on Flickr is tagged with location, there’s an opportunity for Foursquare to layer up that data. We can say, these are all the services that you’re using, these are all the signals that are coming back to us, and this is how we can make your map a little bit different than your friends’ map, because of all the things that we’ve done across all these different properties. In your post this morning, you thank 33 million people for trying Foursquare. How many people are using it each month? I talked to you a few years ago about monetization, and your plan then was to rely on a self-serve model. Now you’re hiring lots of sales people. Did your thinking change? It’s a little bit of both. We have sales people making calls, because that’s how you’re going to go get big national retailers. But I don’t think we’re going to go out there and call every single coffee shop in the country. Even when we were a much smaller team, we had a million merchants that had signed up. A lot of that came from our user community going to places and saying “Hey, I checked in five times. What do I get?” The users have been teaching the merchants about the product. Those are really powerful tools, and we’re taking them and expanding beyond the merchants we have talked to on the phone, and making them available to a million merchants that have already signed up. You started off as a check-in service, now you’re a search tool. How do you get people who used you for check-ins but then stopped to come back? And how do you reach the much larger group of people who have never used you? How do you grow? It’s amazing — you put search front and center, and people are like “Oh, yeah, I can use this to search for stuff.” And when they search, they realize that it’s a lot richer than other apps they’ve been using to solve the same problem. So it’s not that you flip a switch, and you launch an app, and suddenly it’s there. But if you build something great, that people use, people talk to their friends about, people show their friends. That’s how this stuff grows. That’s how it’s been working for us since the beginning. So you’ll build it and they will come? [Laughs] That’s a good way of putting it. Yeah.